Chances are, you’ve taken more than a few photos littered with unwanted objects—or even people—that you’d rather remove from the scene. (Sorry random pedestrians, but I’d prefer if you weren’t in my family shots at Coit Tower.) Macphun's Snapheal (Mac App Store link) is a Mac application that lets you do just that with a few strokes and clicks. 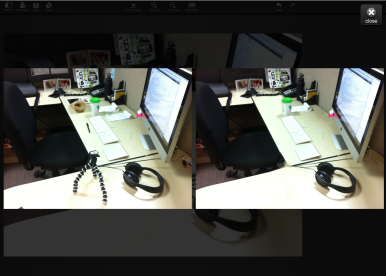 We recently looked at Inpaint ( ), another Mac app that lets you remove objects from a photo. While Inpaint is less than half the cost of Snapheal, Inpaint is a one-trick pony—you paint over a selected area and click Erase. The only adjustment you can make is in brush size. Snapheal offers a bit more. Each of the erasing modes works as the app describes; the actual erase procedure (the most processor-intensive part of the process) happens quickly. And even if you're waiting for the app to erase a particularly large object, you'll be entertained by the Erase progress window, which displays fun facts such as, "There are more than 250,000 rivers in the United States, which amounts to more than 3.5 million miles of river." In general, Snapheal works well, although it isn’t always perfect, as you can see in the image above—specifically, the desk corner just behind the removed object. Once you’re done erasing objects, you can perform simple edits right in the program. Snapheal’s Retouch tab lets you selectively edit parts of an image for contrast, saturation, sharpness, blur, and brightness. You can make full-photo adjustments using the app’s Adjust tool, which includes the same editing options as Retouch, as well as sliders for color temperature, hue, saturation, shadows, highlights, and noise. And a Clone and Stamp tool lets you can make fairly detailed fixes when Snapheal's erasures aren't perfect. Once you're finished, you can save your image to your computer, share it via email, or post it to Facebook, Tumblr, Flickr, or Twitter. Macphun makes the weighty claim that Snapheal "can do magic." The app largely lives up to that claim, offering a simple way to remove objects from an image—you don't need to know anything about photo editing to know how to use Snapheal. If you have Photoshop, which includes a Content-Aware fill feature that accomplishes the same task, Snapheal is likely not for you. But for those who don’t own Adobe’s advanced—and wallet-denting—editing software, Snapheal is an excellent alternative.